This project was so much fun. My daughter and I have been playing with different ideas on how to use this design technique. I'm so excited on how far I can take this...skies the limit! I think I will have to divide this into multiple posts over the coming months. 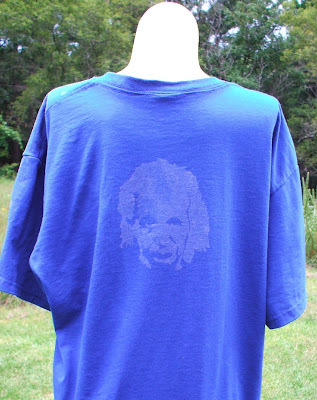 For Einstein bleach tee I will use a stencil and mask technique. A stencil has openings to let bleach through and a mask blocks out areas you want to keep dark. 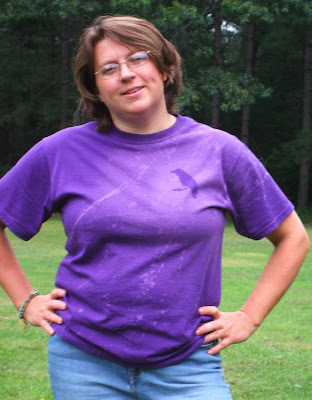 -dark colored tee shirt though it does not need to be black! First you need a stencil. For your first, it may be a good idea to pick something simple. 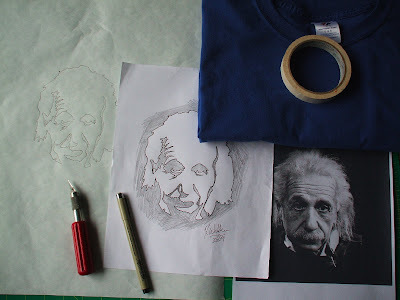 Either free draw your idea on to the paper side of freezer paper or hold the freezer paper over a print out and trace. I like to hold it up against a window pane (instant light box). Decide which areas to cut out. This is the hardest step for me, what to cut and what to keep. 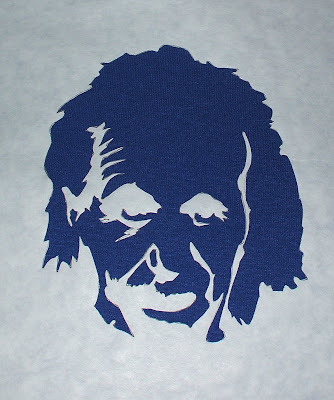 For more detailed designs you will need to use a combination of a stencil and a mask. I decided not to include permanent bridges to attach the eye areas to the rest of the stencil. In order to line it up correctly, I left temporary bridges. Which I removed in the next step. 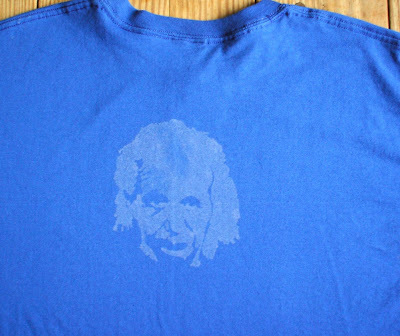 Align the stencil on your tee and iron on using medium heat. 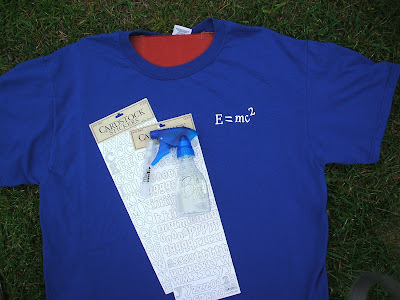 For detailed stencils with areas that "float", iron on the outside of the stencil and tack the corners of the "floating" pieces. Then trim off the bridges that helped line it up. After the "floaters" are trimmed, iron on the rest. Place a piece of cardboard in the shirt to keep anything from seeping through. Tape newspaper around the outside of the stencil to keep overspray from bleaching it out. *I did overspray a bit on the front so it seeped under the stickers. The letters looked muddled, so I touched it up with a blue Sharpie permanent marker. Gotta love Sharpies! 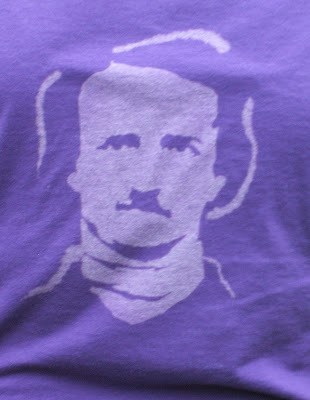 This is the shirt I made for myself with the Raven on the front and Poe on the back. Tips: it is bleach...so be careful. Use the spattering look of some spray bottles to your advantage, it can give your design a mottled look. Try out the spray bottle with water first to adjust the spray pattern to your liking. 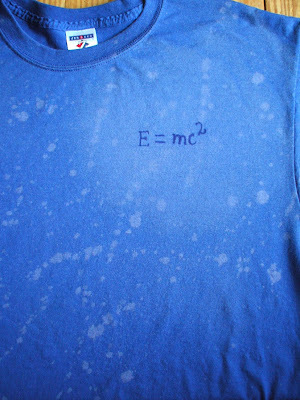 Use a combination of techniques on one shirt. 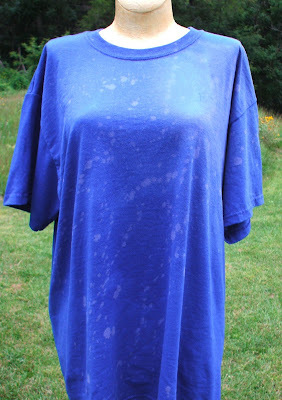 Just wash and dry the shirt in between each application of bleach. Anything can be a mask, but if it is adhesive like freezer paper or stickers leave a sharper edge. Take it even further by bleaching scraps of cotton and using them as patches. 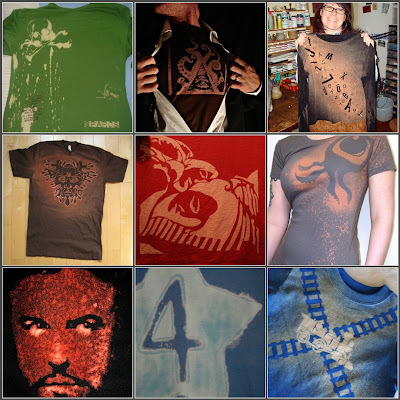 Or combining a bleach design with additional painted or dyed elements. Go crazy and have fun! Michelle Ward is a phenomenal artist (and a great person) and the Queen of Stencils and Masks. Her GPP Street Team blog has great info here and here. Craft magazine had a basic tutorial here. This does look like fun! Thanks for the ideas, Xanthe. This is GREAT Xanthe !! I will get some friends together & play ... Your links were great too.